Symptoms generally include limited range of motion, crepitation or a grinding sensation within the joint on movement and significant weakness. Pain is often exacerbated by activity, and night-time awakening is common. The base of the neck may be "tight" with recurrent spasm, but sensation in the arm is generally normal. Patients do not complain of numbness or tingling, only pain. As in arthritis in other joints, as the surfaces wear, and bone against bone contact ensues, motion becomes increasingly limited. It is common for a patient with shoulder arthritis to present with complaints which are little different than those of a Rotator Cuff Tear. The patients have the same limited active range of motion with pain at the extremes, and night-time awakening, but with rotator cuff tear there is also weakness of rotation. In this situation, the plain X-Ray exam is very helpful in diagnosis. Generally there is no need for MRI or other study unless there is a question of coexistent Rotator Cuff Tear, when this will substantially alter treatment. Treatment of the shoulder with arthritis is dependent upon the cause of the condition and the severity of the arthritis. Patients may have Rotator Cuff Tear, distal clavicle arthritis, or cervical arthritis with symptoms. Nerve entrapment in the upper extremity may even mimic symptoms of shoulder osteoarthritis. Patients who have had recurrent dislocation or massive Rotator Cuff Tear may develop arthritis of the shoulder as a consequence of humeral head impaction against the undersurface of the acromion. "Conservative" measures for the treatment of arthritis of the shoulder consists of oral anti-inflammatory drugs, gentle passive and active range of motion exercises, and strengthening of the rotator cuff musculature which remains intact to maintain function of the shoulder and minimize pain. Ice after aggravating activities, and heat application during intervals between times, may be soothing for symptomatic relief of symptoms. Reverse Total Shoulder replacement may be performed for massive unrepairable Rotator Cuff Tears with coexistant arthritis. It is also sometimes used for severe fractures of the shoulder which include the rotator cuff when slow or poor healing may compromise shoulder function. The reverse design places the Ball on the normal cup side of the shouder and the cup on the humeral stem. This maintains the shouder in its anatomic location without superior migation with reaching and lifting. Shoulder function and pain are often dramatically improved. Shoulder replacement surgery generally requires a day or two of hospitalization. The surgery can be performed with General Anesthesia or Scalene Block with IV sedation. In either instance, a scalene block is utilized for pain relief in the immediate postoperative period. This is an injection of local anesthetic at the base of the neck which numbs the shoulder and gives excellent pain relief for 12 hours or more. Oral pain medicine can often be used immediately with this technique, eliminating intramuscular injections, or IV analgesics. This usually lessens pain after surgery more effectively, since oral analgesics have a longer duration of action than injections. Physical therapy begins the day after surgery. Motion of the shoulder is initiated passively. This means that motion of the shoulder occurs with the help of a therapist or by using a pulley with the non-operative hand to pull the operative arm overhead. The shoulder may also be moved gently by dangling the arm and swinging it forward and back and in gentle circles like a pendulum. This minimizes the load on the rotator cuff which is repaired after shoulder replacement. The shoulder is protected with a sling for a few weeks, and rotation may be aided with a dowel or broom stick aided by the other hand. The stick can also be used behind the back between the arms to aid extension. Passive Range of Motion exercises and modalities for pain and inflammation. (ice and oral anti-inflammatories). Early strengthening using isometrics followed by light active strengthening. Active Range of motion including reaching at arms reach and overhead. Rehabilitation may need to be modified when shoulder replacement is combined with repair of a torn rotator cuff. As with any surgery, there are risks. The shoulder is a complex joint to replace. It relies on soft tissue balance and prosthetic orientation to maintain stability. Dislocation may occur if therapy is improper, soft tissue balance or prosthetic orientation is not correct, or injury occurs. As with any prosthetic joint, infection is the most worrisome risk. This may necessitate prosthetic removal, clearance of the infection and reimplantation. After surgery, antibiotics should be taken before dental cleaning, oral surgery or colonoscopy to minimize the risk of late infection. 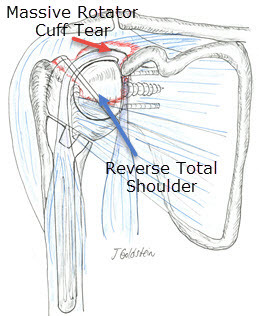 Reverse Total shoulder replacement is generally highly effective for pain relief in instances of severe shoulder arthritis with massive rotator cuff tear. This may be complicated in instances of infection, fracture, or prior shoulder surgery. For more information, please contact our office in Rhode Island. We treat all Sports Medicine and Total Joint Problems.